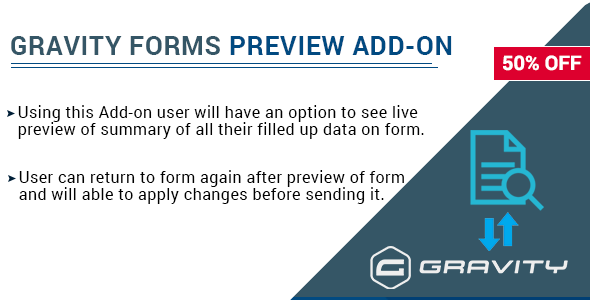 Gravity Forms form preview is a Gravity forms Add-on that allows users to see live preview of your form data before they submit form on your site. This Add-on will help user to fill up their form and preview the form for confirmation before final submission. Using this Add-on user will have an option to see live preview of summary of all their filled up data on form. User can return to form again after preview of form and will able to apply changes before sending it. Preview Plugin will work only if the form data added as steps wizard (pages). Add Page standard fields (must be added). In each page add your form fields in page container. Last page break must contains HTML field. Hidden and HTML fields will not be displayed in preview page. If “Next” button clicked will redirect to preview page (when it’s last form wizard step). Previous button clicked will return back to form for edit. If “Submit” button clicked will submit data.